“When you first look at him there is nothing special there,” Arsène Wenger says of Alex Iwobi, the best young player the Arsenal academy has produced since Jack Wilshere. This is not an unusual view: Arsenal thought very seriously about releasing Iwobi at 14 and again at 16. It was only at 18 that Arsenal, and Wenger, realised just how good Iwobi is, and how important he can be to them. They have guarded him closely ever since. Iwobi’s rise has been a vindication for a player who had been desperate to make it at Arsenal ever since he joined at the age of eight, and who has turned down plenty of good opportunities to leave. It is also a success for an academy which has produced a player whose skills, not as immediately obvious as some, fit perfectly with how Wenger sees the game. “When you look a bit deeper, Alex is always quick connecting with other players, at a very high level and a very high pace,” Wenger explained last month. What is so striking about Iwobi’s rise, less than one year on from his debut, but approaching his 21st senior start, is how he seems to have arrived into the Arsenal first-team almost fully-formed. Arsenal are better this season than they were last season and Iwobi is crucial to that. Alexis Sanchez has moved up front, giving them more speed and surprises, and Iwobi has fitted perfectly into Sanchez’s old role on the left. With Sanchez, Theo Walcott and Mesut Ozil always on the move, Iwobi has to be as fast and as sharp as them. Fortunately for Arsenal he is. While some young players can look lost without too much specific instruction, Iwobi revels in the creative freedom given to him by Wenger, and the trust and confidence his manager has given him. Anyone who watches Arsenal can see how well Iwobi fits in with their fast fluent game, but the numbers bear it out too. Iwobi is ranked sixth by Opta in the Premier League for success rate of attempted final-third passes in the Premier League this season, with 86.9 per cent. Of the five ahead of him, three are team-mates: Mesut Ozil, Nacho Monreal and Santi Cazorla. Iwobi has arrived into the team firmly on their wavelengths: he has three assists in his last five Premier League games, as many as Ozil has in his last 18. Ozil is a great admirer of Iwobi and spoke recently of the great bravery and intelligence of the 20-year-old who plays alongside him. 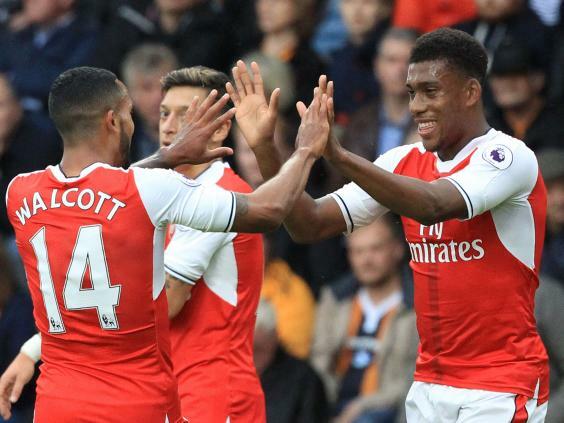 “Alex reminds me of a mixture of Jay Jay Okocha, who I loved watching, and Edgar Davids,” Ozil said. Iwobi’s fearlessness is what has impressed Arsenal the most, especially when he was thrown into the Nou Camp for what might have been a hiding to nothing last March. Some youngsters might freeze on that stage but Iwobi just enjoyed it for what it was, a game of football. That is the mentality, determined to succeed, but also to enjoy the game, that has got Iwobi this far. That was the determination that saw him follow his heart to represent Nigeria as an international, even when Roy Hodgson and Dan Ashworth tried to persuade him last year to change allegiance to England. Iwobi was born in Nigeria but moved to England when he was four and great up at Newham. He played football for Rippleway United, along with Chuba Akpom, who has followed him through the Arsenal system. The coaches there remember Iwobi and Akpom as “head and shoulders” above all the other boys, even if it was Akpom, rather than Iwobi, who was scoring the goals. The two were soon signed up by Arsenal and Iwobi started playing for them at under-9 level. He stayed in touch with Rippleway, attending when he could, providing memorabilia from his famous uncle Okocha for presentation evenings. Competition is tough in the Arsenal academy and when Iwobi was 14, he was very nearly released. Two years later, the club told him that if he had better offers from elsewhere, he was free to go. Crystal Palace, Celtic and Southampton were all very keen on him but 16-year-old Iwobi wanted to stay and prove that he was good enough. Eventually given a professional deal, Iwobi did not do much at first for the under-21s, until his breakthrough season in 2014-15. Scoring 10 goals in 19 games, he immediately impressed Wenger, who realised that he had a rare mix of physical, technical and mental gifts, as he showed in first-team training. Wenger knew that Iwobi was worth hanging on to, so when Brentford, Charlton Athletic and Hull City tried to take him on loan last summer, Wenger said no. He often lets his youngsters go out for experience, but he knew he would need Iwobi. That is the faith that not every youngster is shown, the faith Iwobi was so keen to repay to the manager who saw something special in him. It did not take long after Iwobi’s debut for Wenger to start using him, regularly. After showing at the Nou Camp that he could handle big games, he was a regular in March and April, and this year, he is even more important. He may not have dazzled Wenger at first glance, but he is vital to him now.